// Remark: This post is currently under construction! Wiring layout and source code might be available at the very end of October 2017. 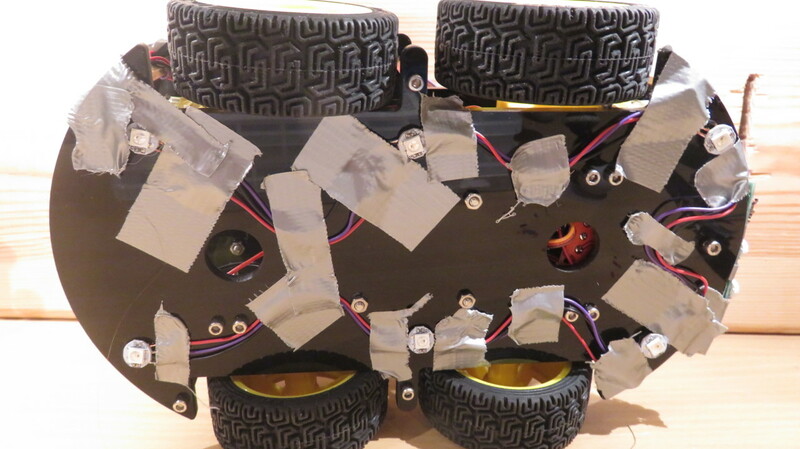 Arduino car before adding the augmentations. The goal of this little project was to get all ideas into a prototype state. Therefore, almost all created augmentations look very prototyp’ish. If I find some time and the augmentations turn out fun, I might continue this project with 3D-printed parts. 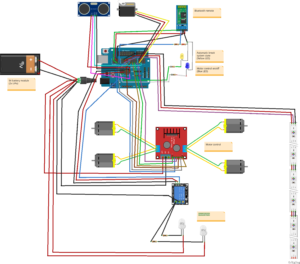 Automatic break system of the Augmented Arduino Car. The automatic break system is basically a pure software update. If the car is driving and an obstacle comes too close, it starts to break immedately. 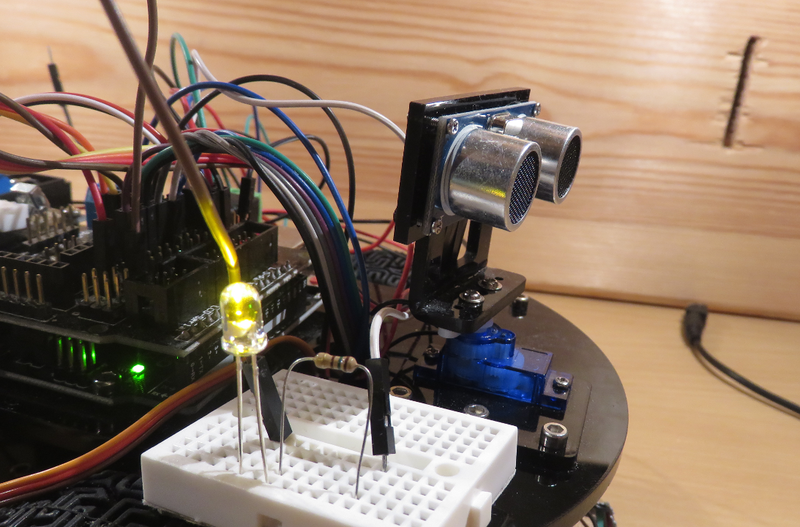 At the same time, a yellow LED will light up to show that the car just automatically stopped. Then a phase of about 7 seconds starts. In this phase, the car can be moved to a “safe position” without being interrupted by the automatic break mechanisms. This phase is indicated by the same LED which starts blinking. If the LED goes out, the car is in “normal” mode and will stop again if an obstacles comes close. 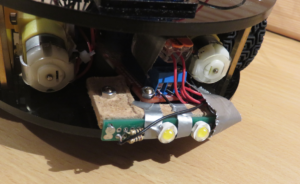 The Elegoo car comes already with an ultrasonic sensor which was is used to implement the automatic break system. Normally, in order to read the distance values from the sensors, the pulseIn-function of the Arduino platform is used. The drawback of the pulseIn-function is that it actively waits while observing the output of the ultrasonic sensor. Therefore, I implemented the distance measurements based on interrupt routines. In particular, my routines are called when the output signal of the ultrasonic sensor switches from HIGH to LOW or from LOW to HIGH. 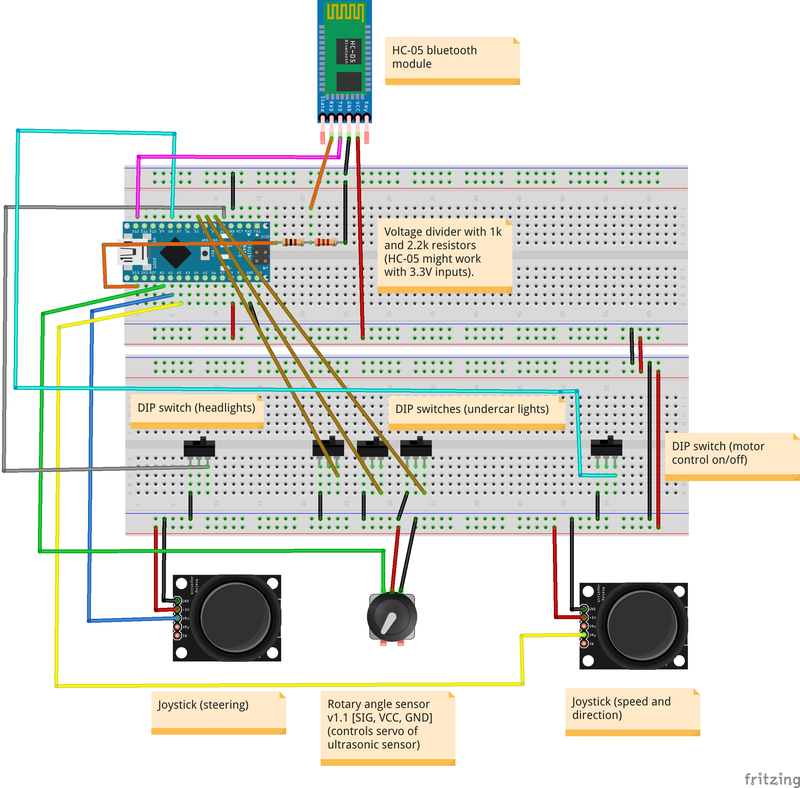 By using this approach, the Arduino does not need to actively wait for something and the saved time can be used for other things, such as handling the bluetooth communication. The headlights augmentation consists of a relay breakout board and a pair of power LEDs. For the headlights, so-called “power LEDs” are used. In contrast to conventional LEDs, they require a forward voltage between 6 and 7 Volt. As a result, they shine very bright. 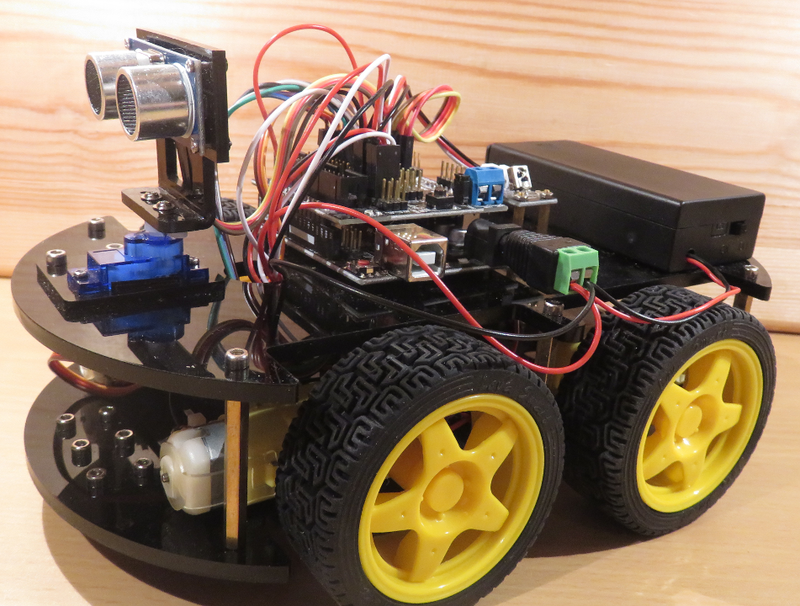 Luckily, the Elegoo car comes with a 9V battery unit. Therefore, using such “power LEDs” is not a problem at all. In order to separate the Arduino’s 5V circuit from the 9V circuit which powers the headlights, a relay breakout board is used. Such relay boards can be used with any of the Arduino’s digital or analog output pins. Moreover, the relay board has an LED which indicates whether the relay is in close or open state. This is especially useful for debugging a program or wiring layout. Depending on the viewer, the undercar lights improve the look of the Elegoo car. For this task, WS2812B LED modules are used. Multiple WS2812B can be cascaded and then individually controlled. This makes them perfect for showing individually programmed lighting routines. 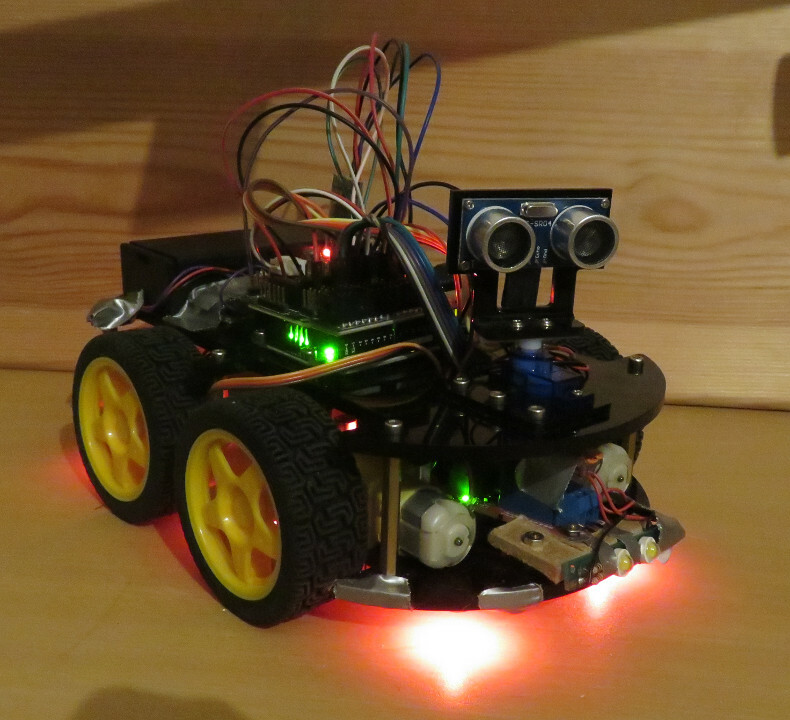 In total, six WS2812B LEDs are added to the Elegoo car. The lighting routines were programmed with the FastLED library. Undercar lights of the augmented car. Bluetooth remote control for the Arduino Elegoo car. The Elegoo car comes already with a Bluetooth HC-06 module. In order to communicate with this Bluetooth module, a Bluetooth HC-05 module was used. The difference between the HC-05 and HC-06 is that the HC-05 can be set to be either Master or Slave. On the contrary, the HC-06 can only be set to be Slave. Therefore, one requires a HC-05 module if a Bluetooth communication should be established with the existing HC-06 module. The heart of the remote control is an Arduino Nano, since it is very small and fits perfectly on a breadboard. The Arduino Nano handles the Bluetooth communication and takes care of all the connected knobs, switches, and joysticks. I thought a lot about how to implement steering and acceleration. 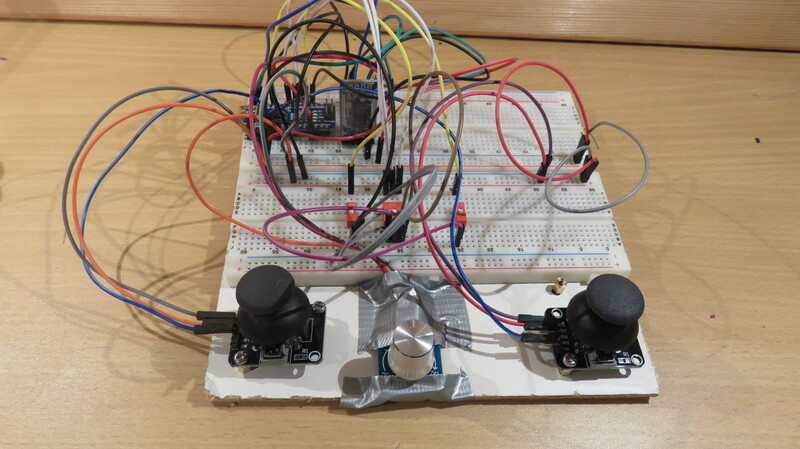 After some tests, I decided to use two joysticks placed on the left and right: The left joystick controls the steering and the right joystick controls the acceleration (speed and direction). This means, only the x-axis of the left joystick and only the y-axis of the right joystick is used. All in all I’m very happy with this decision. Controlling the car works like a charm. 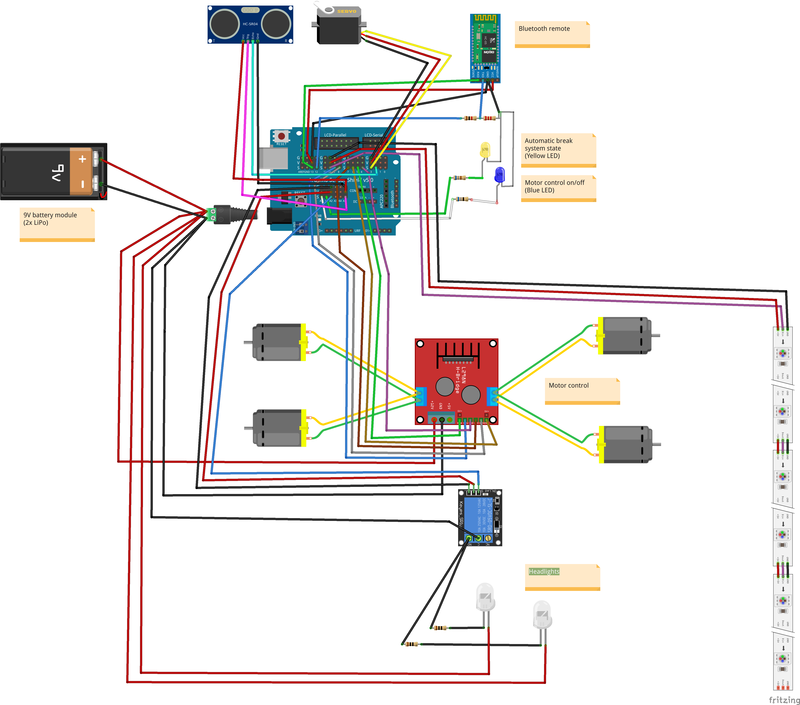 Wiring Layout of the bluetooth remote control for controlling the augmented Arduino car. Fritzing file of the Augmented Arduino Car. This entry was posted in Development on October 27, 2017 by mschoeffler.